Study ATC audio three ways with PocketATC: structured study of all frequencies, random practice, and a comprehension quiz. 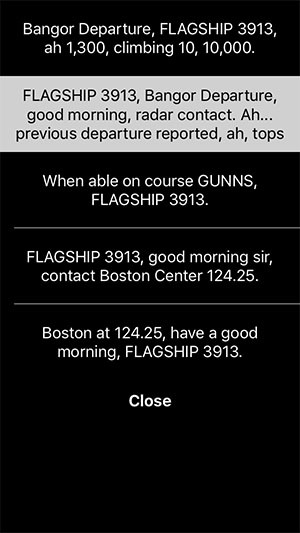 By letting you effortlessly navigate through recordings of actual interactions between air traffic controllers and pilots so that you’re exposed to a far richer range of situations than most pilots encounter during their own flying, PocketATC offers a faster, cheaper, and less intimidating way to master the foreign language of ATC terminology. Version 1.5 includes more than 400 conversations between GA, airline, and military pilots and air traffic controllers at nine airports (KADS, KATL, KBGR, KBOS, KDED, KFLL, KLAX, KMIA, and KSEA)--everything you need to gain fluency while hanging around down here at 0 ASL. PocketATC offers three ways to study ATC conversations: structured study, random practice, and a comprehension quiz. After the first use, this screen also indicates how much of the app's content you've worked your way through, and how many times you've listened to the conversations it includes. Work your way through all the conversations in the app, in order of difficulty. You’ll start with the slowest-paced conversations and move on to conversations with more background noise and faster speech as your proficiency grows. Conversations have been organized by radio frequency. As you study, you can view the transcript for each conversation one line at a time or view the entire conversation on the screen at once (see "Transcript View" and "Conversation View" below). Conversations have been split into individual transmissions so that you can focus on each line before moving on to the next one. The app keeps track as you progress through each frequency so that you can gauge how far you've come, and how far you have left to go. Start from scratch at any time by resetting your training record for the frequency whose conversations you wish to study again. Or, draw conversations from the app’s entire library. As with structured study, you can view the transcript for each conversation one line at a time or view the entire conversation on the screen at once (see "Transcript View" and "Conversation View" below). Once you've finished listening to the conversation, you can repeat it, view its transcript, or move on to the next conversation in the pool. Arrow buttons let you navigate back and forth through the conversation (by moving back to the previous transmission or forward to the next). You can also play the transmission's audio as many times as you like or display the entire conversation at once (see "Conversation View" below). Tap the swirling arrow button to return to the Conversation Summary, from which you can move on to the next conversation. View the entire conversation in list form. You can play any transmission in the conversation by tapping it in the list. Tap "Close" to return to the Transcript View. Test your comprehension by listening to the audio and filling in the blank. Once you've answered, you can view the entire conversation from which the transmission was taken.